"Everyone is being such polite Canadians tonight," remarked Katie Monks as she paused to change guitars between songs at the nearly sold-out show at Winnipeg's Good Will Social Club, noticing the venue was strangely silent as she switched over. It's difficult to capture a crowd's attention after a few songs on a Tuesday, but that's exactly what Toronto's Dilly Dally did. After the potent opening of "I Feel Free" and "Sober Motel," from 2018's Heaven, and the melodic intensity of "Doom," the crowd had already bought in. With only four dates left after an extensive tour and in the middle of the prairies on a Tuesday night, it could have been easy for the road-tested group to phone it in and still come off with a better performance than way too many bands. Paired with a dual attack of fuzzy guitars, Monks' long, drawn-out scream in "Sober Motel" morphed into its own wall-of-sound without losing any intensity and was easily one of the highlights of the night. Often overlooked, the ricochet snares, crashing cymbals and heavy hands of drummer Benjamin Reinhartz are a key part of the Dilly Dally's impact. His powerhouse style seemed to elevate the band's sludgy and fuzzy sound, separating them from other artists who may share similar styles and influences. Somewhere in Dilly Dally's thick, buzzing guitar shield of sound, you'll also find some quirky, minimalist guitar solos, something that's difficult to pull off unless you can make the most out of simple melodies and some effects. Having seen the band at M for Montreal a few years ago, it's quite obvious that time on the road and in the studio has allowed the band to grow their songwriting while not sacrificing any of the energy and passion that made them get noticed in the first place. "Marijuana" and "Sorry Ur Mad" from Heaven are perfect examples of that evolution with Monks' ability to manipulate her vocals from delicate to searing and into the loud-soft-loud style made popular by bands like Pixies, the Breeders and Nirvana. The left turn to the slow-burning "Bad Biology" could have been a mistake in the encore, instead, it only emphasized the intensity of the rest of the night. 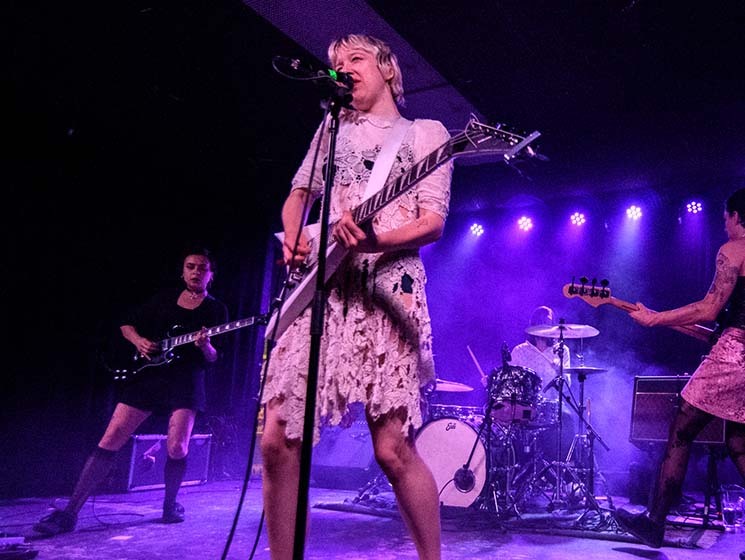 While we may be over two decades outside the '90s, groups like Dilly Dally still come off as vital, pissed off and passionate as some of the bands who may have influenced them.